Peel kiwi fruit and apple, cut into chunks. Add to blender with pineapple and lemon juice along with a couple ice cubes. Blend until smooth and serve straight away. 14 members have added this recipe to their cookbook. 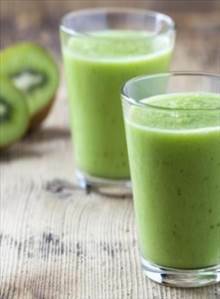 There are 186 calories in 1 serving of Kiwi Fruit Smoothie. Calorie Breakdown: 3% fat, 94% carbs, 4% prot.